Astronomic Digital Timer that we offer is known for providing the exact time depending upon latitudes and longitudes of the Earth. It is perfect to be used for commercial as well as residential purposes. The best thing about our Astronomic Digital Timer is that it consumes very less power. 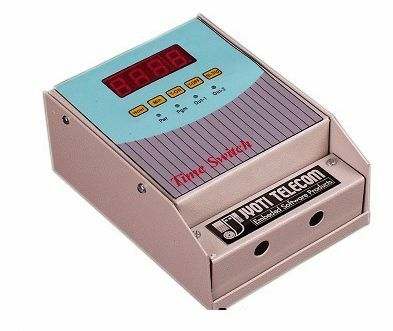 We are one of the eminent Manufacturers and Suppliers of Digital Timer. It can be obtained from us at the best market price. Daily automatic regulation of sunrise & sunset time. Summer, winter, rainy time automatic update. Sunset & sunrise times can be viewed on the screen. LED display to view Time, Day, Date by program. Allows energy saving via programming of time & geographical area of installation. Ideal for outdoor and Building lights, Street lighting application. 4 digit red seven segment LED module. 230 V AC / 5 amp load. Supply : 230 V AC (-10% / +15%) 50/60 Hz. Operating temperature : -20 / +70. Storage temperature : -30 / +70. Time sensitivity : 0.5 s/ Day. Clock battery life : 1 year.